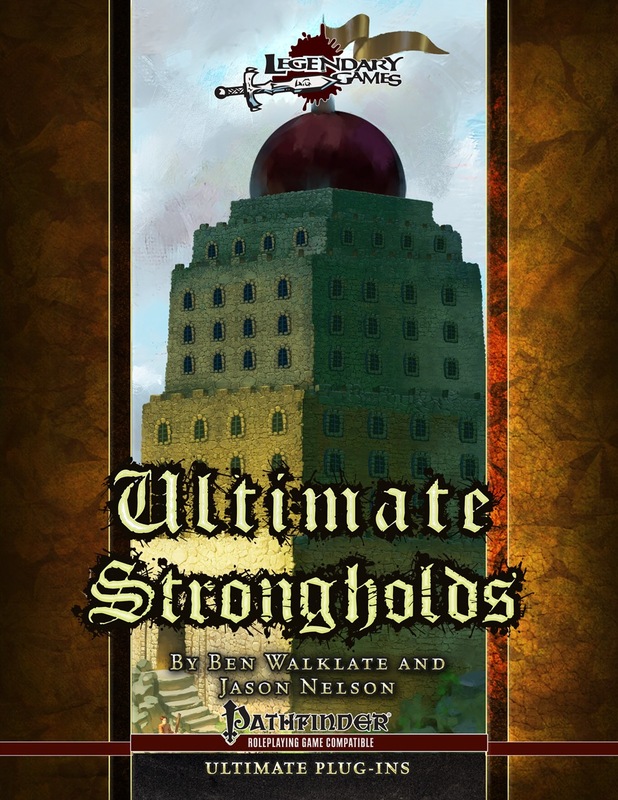 Ultimate Strongholds brings you an awesome array of fantastic fortifications for your Pathfinder Roleplaying Game Campaign! This exhaustive encyclopedia integrates all levels of Pathfinder play, including party-level adventuring as well as downtime, building, and kingdom rules from Pathfinder Roleplaying Game Ultimate Campaign! Explore tons of new options for buildings, rooms, augmentations, and fortified buildings, as well as unusual building locations. Dive into siege warfare with an array of siege weapons, ammunition, and special structures and building materials. 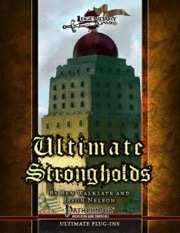 Ultimate Strongholds goes far beyond the basic building blocks, of course, with a wealth of information for buildings integrated with kingdom and settlement attributes and a host of exotic strongholds and structures, from cloud castles to water walls, flesh piles to crystal palaces, hedge forts to ghostly redoubts, with rules for damaging such bizarre and magical constructions and the hazards they bring! Plus you get over two dozen new spells ideal for defending your stronghold or breaching the holds of your enemies like battering bolt, deathless defenders, and spiritual pike wall, along with spells to enhance the fortress itself like elemental architecture and haunted ruin! Last but not least, you also get the brand-new castellan prestige class that guides and guards a fortress like no one else can! Grab this amazing 48-page accessory from Ben Walklate and Jason Nelson and Make Your Game Legendary! BEHOLD! Everything you ever wanted to know about buildings and fortifications but were afraid to ask! When is the KS for a compilation? Would absolutely love to get in on that! Mayyyybe next year. There's the small matter of Ultimate Armies to finish, and I'm neck-deep in other urgent stuff. There might also be a trade and caravans book for this line. Maybe. At the moment, that's just a notion; nobody's working on it actively. I’m always amazed at the reception these get. Oooh! You're going to convert Bloodstone! Very cool! I plan on using parts of that myself. We'll have to trade notes! H4 Throne of Bloodstone has the all-time BEST/WORST flavor text in the history of adventure writing. "You see a large horned monster. It charges you." That's all the setup you get. Pretty sure it was 1E. 1-3 where 1E, the last installment came out during 2E. I stand (well, sit in a comfortable chair) corrected. My copies are in storage and I was at work so couldn’t check before posting. This from a guy who found a scientific research paper on the breaking stresses of gingerbread so that he could work out hardness, hit points per inch of thickness, and cost of walls made of gingerbread. Awesome!!! Jason, have you thought about collecting all of the Ultimate supplements into one mega-supplement? As mentioned up-thread, Legendary Games might be able to do an “Ultimate Kingdoms” compilation next year, but there’s still at least one (possibly more) book in the pipeline (Ultimate Armies, I’m looking at you) and other important projects that Jason has to manage, so the best answer right now is “maaaaaaaaaaybe”. Thanks for the tip, Ben! Always like to see good ol h1-h4 bloodstone series mentioned. IF anyone does it I would be first in line! Oh, I am soooo in for Trade and Caravans. I have some notions for my own use, but I'd love to see a fully fleshed-out take. HOw the heck do I post ? I can't find button to start new thread.